Al-Masry Al-Youm (Arabic: المصرى اليوم‎ al-Maṣrī l-Yawm, IPA: [elˈmɑsˤɾi lˈjoːm], meaning The Egyptian Today) is an Egyptian privately owned daily newspaper that was first published in June 2004. It is published in Arabic as is its website, almasryalyoum.com. 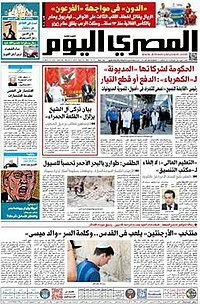 An English version of the website was introduced in 2009 as the Al-masry Al-youm English Edition, which later evolved into Egypt Independent. It strives to be a full-service multimedia news organization for Egypt. Typical Al-Masry Al-Youm front page. The newspaper was founded in late 2002 by Salah Diab, an Egyptian businessman whose grandfather (Tawfik Diab) was one of Egypt's most renowned publishers in the 1930s and 1940s. Hisham Kassem is also a founder of Al Masry Al Youm. In 2004, its establishment was finalized, and on 7 June 2004, it published its first edition. The publisher of the daily is Al-Masry Al-Youm for Journalism and Publication. ^ عن المصري اليوم. Al-Masry Al-Yaum (in Arabic). Archived from the original on 2 October 2010. Retrieved 23 October 2010. ^ "Newcomer on Egyptian newspaper market making headlines". Arab Press Network. 27 March 2009. Archived from the original on 28 July 2013. Retrieved 1 March 2013. ^ Sami Kamal Al Din (2005). "600 publications in Egypt and not enough readers". Al Ahrām Al 'Arabī. 26: 40–43. Retrieved 8 September 2014. ^ "Zoellick's visit to Egypt (July 13–14)". Wikileaks. 18 July 2005. Retrieved 2 January 2014. ^ "In the Egypt Independent's closure, an end of a beginning". Columbia Journalism Review. 30 April 2013. Retrieved 4 May 2013. ^ "And we're back ..." Mada Masr. 30 June 2013. Archived from the original on 3 August 2013. Retrieved 4 August 2013.